From the beach, a gleaming pipe floats in the horizon. It’s a testament to our time and reminds us about our dependence on water and about our need to appreciate and value this vital gift. It also teaches us that water is plenty and nature provides. We just need to learn to work with it, keep it clean, and appreciate it. Multiple pools of hot and cold, crystal-clear saltwater invite visitors to experience a ritual that takes them away from the stress of daily life. Relaxing on the pool deck, listening to the sound of the waves, and looking out to the ocean, visitors can be blissfully unaware of the seamless technology at work all around them. 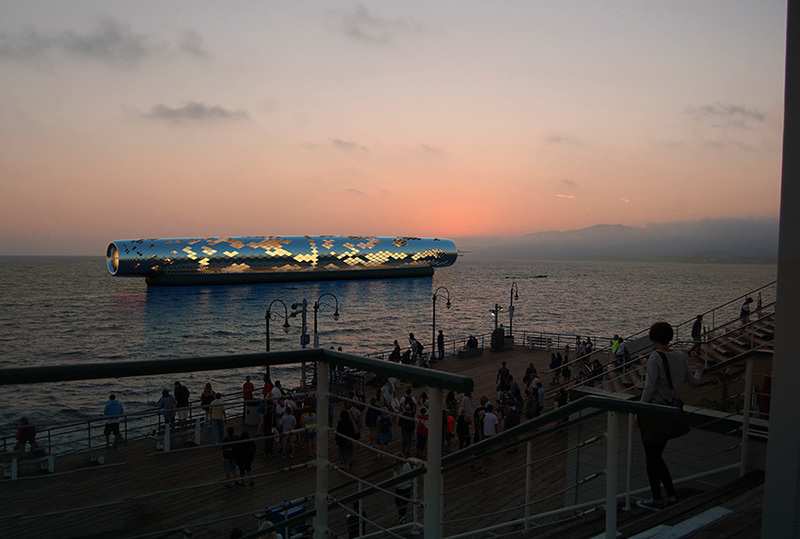 Above, solar panels provide power to pump seawater through an electromagnetic filtration process below the pool deck, quietly providing the salt bath with its healing water and the city with clean drinking water. The Pipe represents a change in the future of water. Water never leaves our planet. Rather it is simply displaced. Fresh water finds impurities and becomes temporarily unfit for consumption. These impurities can be visible or invisible. The visible particles can be filtered with basic procedures. It is the invisible impurities (dissolved solids) that make filtration complicated and costly. Conventional desalination technology such as reverse osmosis uses excessive electricity, generates unwanted industrial waste and polluted water, and requires very expensive machinery. Ninety-seven percent of seawater is pure water and only three percent is dissolved solids. All dissolved solids in water become ionized and can therefore be controlled through electromagnetic energy. Electromagnetic filtration uses an isolated electromagnetic field on pipes circulating seawater, separating the salts and impurities. The process is rapid and energy efficient. What results are two products: pure drinkable water that is directed into the city’s primary water piping grid, and clear water with twelve percent salinity. The drinking water is piped to shore, while the salt water supplies the thermal baths before it is redirected back to the ocean through a smart release system, mitigating most of the usual problems associated with returning brine water to the sea.